Here’s part 1 about my basic approach to menu planning for one. One of the most important things to cooking and eating healthy, thoughtful meals is keeping my kitchen well-stocked at all times with all the basics that I need. That way, when I decide on a menu plan for the week, it’s only the out-of-the-ordinary fresh stuff or maybe a random pantry item that I need to buy. This makes shopping quicker and cheaper! As I go throughout the week, I keep a grocery list clipped to the fridge where I write down any pantry items that I’m running low on or need replacing, and then when I’m menu planning I add any fresh stuff to the list that I’ll need to pick up as well. Here’s how I stock my kitchen; adapt as you see fit for the stuff you actually use and cook most often. I keep the ones I use the most right next to the stove for easy access: cooking oil/spray, salt & pepper. By keeping this small collection of items on hand at all times, I nearly always find I’m able to whip up a quick batch of cookies or a simple bread or cake without even going shopping. I try to stock up and buy all this stuff when it’s on sale. I’ve also found with tea in particular, it’s nice to have created a “guest collection.” I keep a basket of various types of herbal, black, rooibos & green tea that I pull out and offer when I have company so people can choose whatever they like. People always seem to think this is such a nice touch, and it is so easy! Dry pasta – I always have a long and small kind on hand. Right now it’s fusilli & spaghetti. Dry herbs & spices: cinnamon, cardamom, nutmeg, cloves, basil, oregano, rosemary, cayenne, red chili flakes, curry powder, bay leaves, ginger, paprika, mustard powder, cumin. Marmite – this is how you can tell I have British blood! Water chestnuts – love them in stir fries and spinach dip for crunch! I love having a couple of lemons or limes on hand for adding to impromptu salad dressings or sauces. I eat a lot of veggies but the list below are just the ones I keep on hand all the time, regardless of what I’m cooking that week. I make a veggie egg scramble for breakfast very often with zucchini, peppers and mushrooms so I keep those around all the time for that reason, and there’s enough veggies/fruit/cheese in the house all the time that if I have greens, I can always whip up a salad without going shopping. Greens and bananas are also great for smoothies, so I try to have them around all the time. Lemon & lime – and if I don’t need the rind for whatever I’m making, sometimes I’ll zest the peel and put it in a ziploc in the freezer. Fruit for smoothies – always mixed berries, occasionally peaches or mango. That’s it! With these items constantly available in my kitchen, I can always whip up a quick salad, smoothie, “stuff on bread” meal, or pasta dish without needing to go shopping, and it minimizes the extra ingredients I need to buy for a recipe. You should use this as a basic guide, but adapt as necessary to the things you tend to eat most. How can you use this to simplify your shopping? 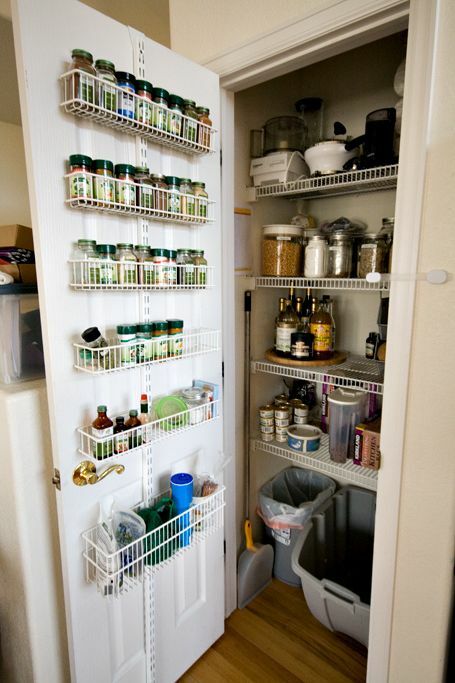 How would your pantry staples differ from mine? This entry was posted in Food, Systems, Wellness and tagged food preparation, kitchen organization, menu planning, pantry stocking on April 21, 2013 by A Little Coffee.